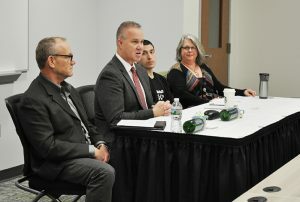 Our very own Brian Gray, Director of Clinical Engineering and Environment of Care, recently served as a panelist at a Stevenson University lecture, Sustainability in the “Real World”: Preparing Students for Tomorrow’s Careers. During the panel discussion, sustainability professionals across various industries discussed ways they have integrated sustainability into what their businesses do and how students across all disciplines can be prepared for careers in a variety of sectors. Brian has been with MedStar Harbor Hospital for 26 years. In his role, he manages the biomedical equipment, emergency preparedness, safety management and the hazardous waste programs. He became the sustainability officer in 2011 and works closely with a core group to accomplish key environmental goals. Great work Brian, and thank you for representing MedStar Harbor in the community. 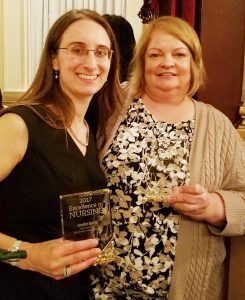 Jennifer Martin, RN and Phyllis Tutin, RN are pictured here. Five of our MedStar nurses have been selected among 50 of the region’s top nurses in Baltimore magazine’s “Excellence in Nursing” Survey. Jennifer Martin RN, Acute Care/Family Practice/General Medicine – MedStar Harbor Hospital; Phyllis Tutin, RN, Cardiovascular – MedStar Health; Jiang Xiao, RN, Medical-Surgical Nursing – MedStar Good Samaritan Hospital; Ashley Shelter, RN, Orthopedics – MedStar Union Memorial Hospital; and Amy McArdle, RN, Pediatrics: Neonatal – MedStar Franklin Square Medical Center, have earned the recognition for their extraordinary contributions to health care. This is a nomination-based award and represents nurses who are the finest in their field according to peers, supervisors, and patients. Find out more details in the May issue of Baltimore magazine. Congratulations to all of you and thank you for all your hard work.